A while back I posted support for the Baby Bestiary vol 1 and 2. Volume 1 is now up for the Best Interior Art and Best monster/adversary ENnies and it is no surprise. The book is absolutely gorgeous. +Andreas Walters has put together a fantastic book that is part monster manual, part field guide, part ecology book and a huge part art book. The book is a densely packed 81 full-color pages. Easily one of the best-looking books to be nominated for an ENnie. Each monster description comes with details on what the young of each monster is called (a baby Hippocampus is known as a "fry" for example), how hard it is to train the young and other vital facts such as danger and intelligence levels. The book would make for a great coffee table book really and I hope there is a nice leatherbound option in the future collecting both volumes. Of course, the obvious choice here is the older gamer that has kids that LOVE monster books. I have forgotten how many times I have had to go on rescue missions to my kids rooms to find my D&D books. I still have a Pathfinder book that I can't account for in fact! 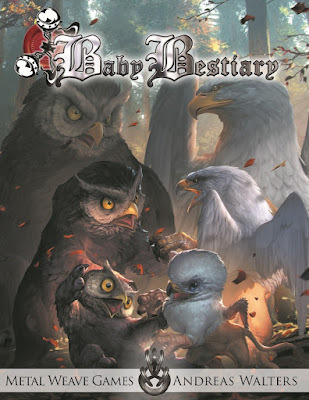 For younger kids a "baby monster" game, ala Pokemon, gotta catch them all, would be fantastic. Since there is little to no "crunch" in this book it is compatible with a wide variety of games. Play your favorite game, use this book as your guide and go monster hunting with your kids. In any case, this is a really fun book and I am really looking forward to Volume 2. I am up for an Ennie this year for Best Blog! Please click on the link and vote "1" under "The Other Side".